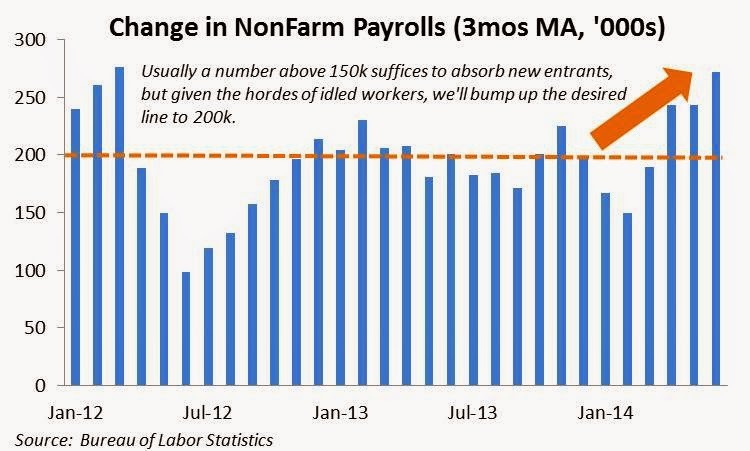 The Recent Equities Slide: A Momentary Lapse of Irrationality? In a January investment note, we expressed caution towards U.S. equities, which at the time had been nearly five years into a bull market. Not that we expected a strong correction, much less a bear market, but it was unlikely that 2013’s 29.6% gain in the S&P 500 would be anywhere near repeated. Through the first eight months of the year, that forecast has played out with the S&P up a more pedestrian 4.5%. We did not, however, expect the index arriving at this point by initially sliding nearly 6% before rallying 14% to a record high of 1,988. While the winter’s dip at first appeared to be an outlier to the smooth upward trend (notice the nearly parallel lines of the moving averages below), the recent 2.8% retreat has again raised the eyebrows of more than a few cautious market participants. 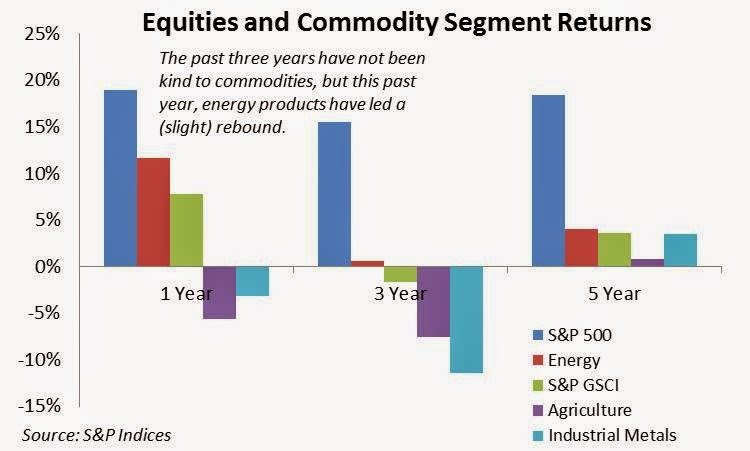 Commodities in 2014: A Place in the Portfolio? At a conference in 2007, a speaker initiated the proceedings by posing the question “what are the most expensive words in the English language?” The answer to this was “it’s different this time.” The subject of the event was commodities, namely whether or not the space had developed sufficiently to be considered a viable asset class and a beneficial component of investors’ portfolios. During those heady pre-crisis days, the winds indeed appeared to be at the back of investing in raw materials. So much so that experts filled investment notes and the financial press with talk of a commodities super-cycle, driven by shifting supply/demand dynamics and rising investor appetite, partly fueled by the proliferation of new, accessible products. During the crisis and its immediate aftermath, the bullish case for commodities remained largely intact. This was the period when emerging markets…a theme related to commodities demand….were the engine that kept the global economy (barely) treading water. Aggressive monetary policy also provided support to the commodities space as investors ventured farther out along the risk spectrum in search of yield. A key attraction to commodities during the roaring 2000s was that they had become a viable source of returns, something that had eluded the asset class for decades. Since the initial post-crash period, which was marked by the binary risk-on / risk-off trade, with Treasuries encompassing the latter and nearly everything else mindlessly lumped into the former, markets have shown greater differentiation among asset class performance. And during these past three years commodities have really taken it on the chin. As seen in the table above, even as equities have sailed along at nearly a 16% annualized clip, total returns for the broad S&P GSCI commodities index have dipped into the red, with the agriculture and industrial metals buckets especially getting pummeled. Now, with U.S. equity indices hovering near record highs, developed market bond yields at historic lows and trillions of dollars in fiat money lurking in the shadows, an investor must ask if dialing up commodities exposure at this time may at least in part address some of these sources of consternation. Long considered a niche investment, commodities as an asset class have exhibited characteristics over the decades that were attractive to investors. They lacked correlation to major asset classes like equities and fixed income, meaning they could provide diversification when included in portfolios. Not coincidently, they tended to be positively correlated to the bane of many investments: inflation. The logic was that rising raw materials prices squeezed corporate margins, thus diminishing the present value of a firm’s future cash flow, which by definition meant a lower stock price. 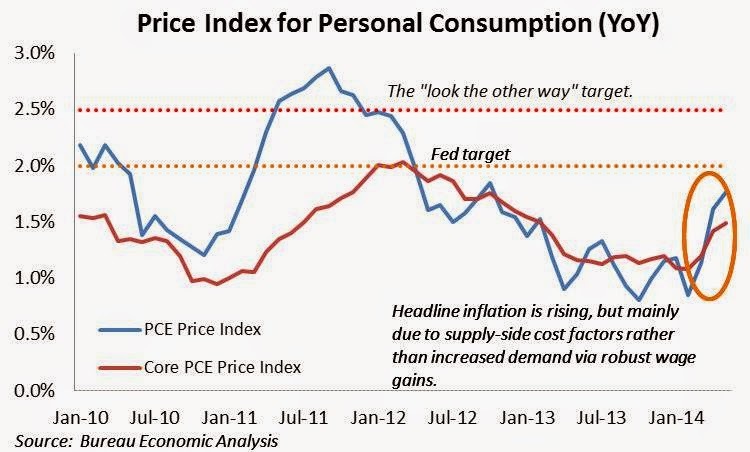 Moderate inflation, driven by increased demand accompanying robust economic growth could allow both input costs (e.g. commodities) and stock prices to rise in lock step, but only up to a certain point before consumers get squeezed and snap shut their wallets. Conversely, inflation caused by an adverse supply shock of key raw materials…so-called cost-push inflation….seldom bodes well for stocks. Similarly, inflation and bonds are akin to oil and water. 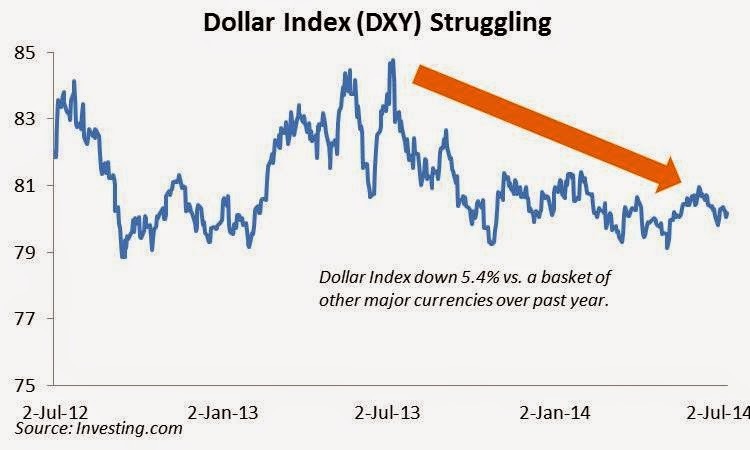 Any whiff of upward price pressure, regardless of the source, usually sends bond investors fleeing. The downside to this inflation hedge and lack of correlation has been the volatility inherent in commodities, the difficulty in accessing them (historically available mainly through futures contracts and the physical market), and perhaps most importantly, the absence of any respectable yield. 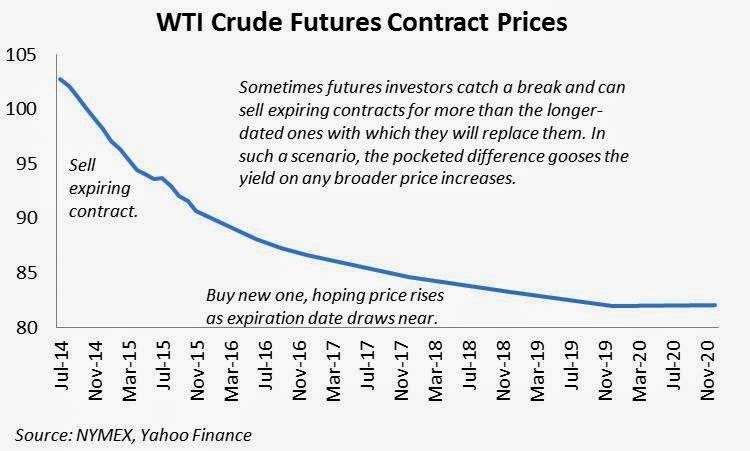 In fact, not only does a hunk of metal or bushel of corn not pay a coupon or a dividend, but investors often incur holding costs such as those for storage or rolling over expiring futures contracts, which were priced lower than farther-dated replacements. Why were yields historically paltry? A simple answer is supply and demand: For much of the 20th century, there was plenty of easy-to-find oil, copper and arable land. 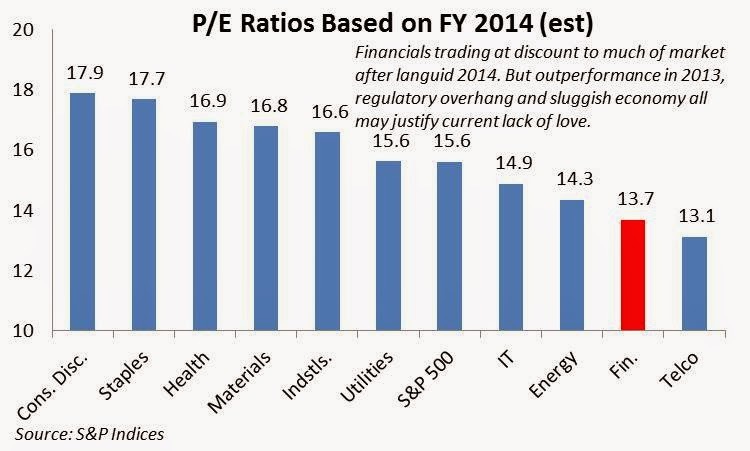 As long as balances favored supply, it was difficult for raw materials prices to go on a sustained tear. 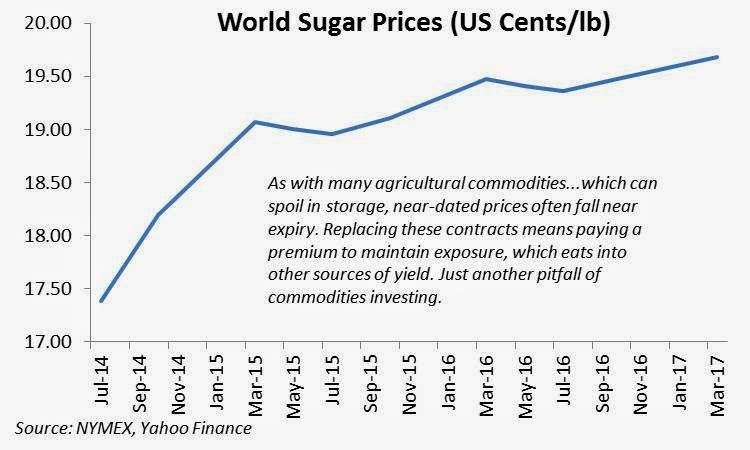 Either producers would bring more product to market to meet increased demand or incipient inflation would sour consumers’ appetites in what industry-types call demand-destruction. What fractured this status quo was, in a word, China. Over the past three decades much of the world’s manufacturing capacity was relocated this rising giant and to other low-cost countries. The industrial base of these developing nations was less than efficient, meaning for every unit of output, a greater amount of inputs was required vis-à-vis developed markets. This was true for energy consumption, the utilization of metals and an array of other raw materials. The lack of efficiency also applied to nonexistent pollution standards, but no worries, none of that toxic air drifted across the Pacific. Right. At the same time these countries were updating infrastructure and housing, increasing demand for construction materials such as copper, steel and electricity (city dwellers are more energy intensive than country folk). Not to be left out, demand for agricultural commodities increased as large populations switched to protein-based diets, which paradoxically, require a greater amount of crops like soybeans and corn to fatten up cows and hogs for slaughter. At the same time…..this was prior to the shale revolution sent from above….cheap sources of raw materials began to peter out. The crude, copper and aluminum were still there, but these harder-to-access materials required additional expenses in R&D, exploration and extraction, thus pushing up marginal costs. It was the confluence of this increased demand inconveniently occurring as supplies were pressured that lent credence to the super-cycle premise. Sensing there was a buck to be made, the investment community funneled cash to commodities firms to develop new resources; they also became active participants in the physical and futures markets. Why a bank needs to own a warehouse full of zinc is beyond me. But they did, resulting in increased demand from financial…or speculative…players, who bought raw materials not to produce anything, but simply to flip them and keep the profit. But this increased investor attention led to an increased correlation between commodities and other risky assets such as equities, undercutting one of the primary attractions of commodities in the first place. The measures undertaken in the wake of the financial crisis reinforced this development as yield-starved investors lumped all riskier…thus higher yielding….asset classes into the same bucket. Rock-bottom interest rates also played a role by making it cheaper to finance highly-levered commodities futures. 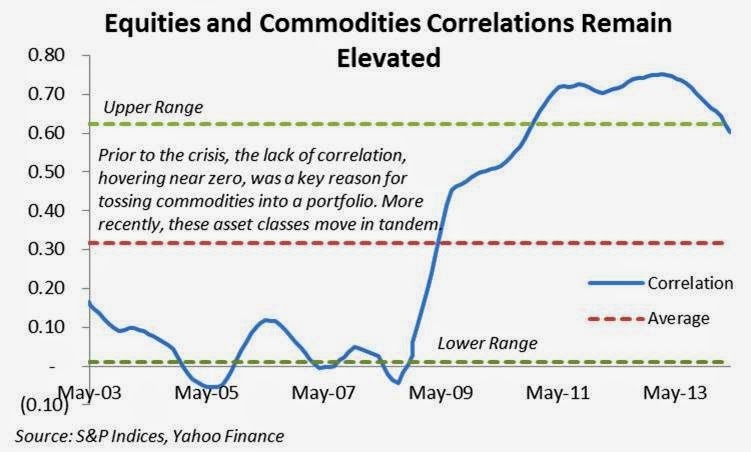 As evidenced in the chart below, beginning in late 2008, the historical lack of correlation between equities and commodities abruptly rose to a range consistently above 0.50. Since the depths of the financial crisis, it is safe to say that financial markets have returned but the economy hasn’t. 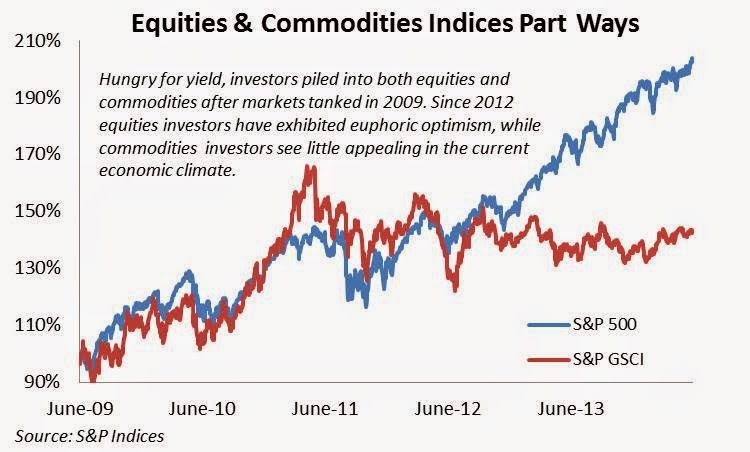 This dynamic is represented by commodities, as measured by the S&P GSCI index, having traded sideways since mid-2011. 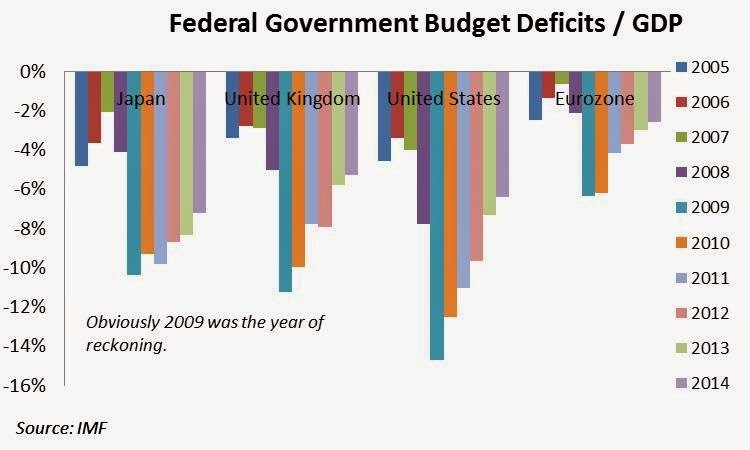 Over the long-term, supply/demand fundamentals (theoretically….a loaded word) determine the prices for raw materials, and without robust growth in major economies, the 2009-2011 rally proved impossible to sustain. The divergence in fortunes between commodities and equities is also a reminder that increased correlation refers only to direction and not magnitude. Another knock against the increase in speculative investors…as opposed to commercial users of physical commodities….is that often their allocation decisions are driven by macroeconomic developments rather than fundamentals. Yes, the participation of a certain amount of financial players increases liquidity, thus market functionality, but when taken too far, it distorts necessary signals from underlying supply/demand dynamics. This was certainly the case in the two years immediately following the crisis when the broad S&P GSCI returned a total of 25% and the energy, industrial metals and agricultural buckets returned 20%, 70% and 32% respectively. Since then, the broad index has returned -6%, with metals and crops getting especially routed. Certain segments of the commodities universe are more tightly tied to economic growth. It should come as no surprise then that two such sectors, energy and industrial metals, have suffered over the past three years as global growth remains elusive. 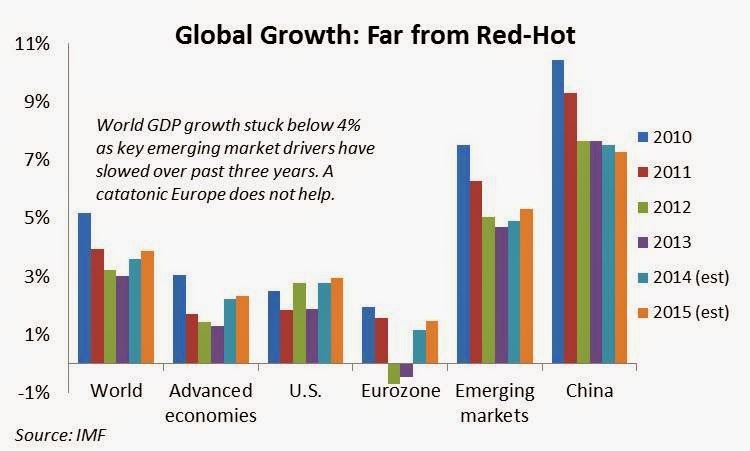 As seen below, growth since 2010 has been on a downward trajectory for most global regions. Of special concern is the lower rate of expansion in emerging markets, which had been the shining star after the crisis. 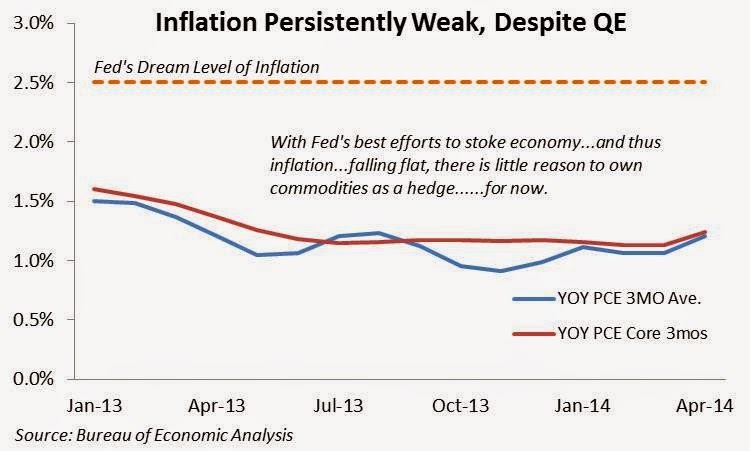 With economies stuck in low gear, inflation remains muted. While the Fed’s favored inflation gauge (below) ticked up to 1.6% year-on-year in April, the rolling three-month average is still a minuscule 1.2%, far below the 2.5% that they would happily accept. 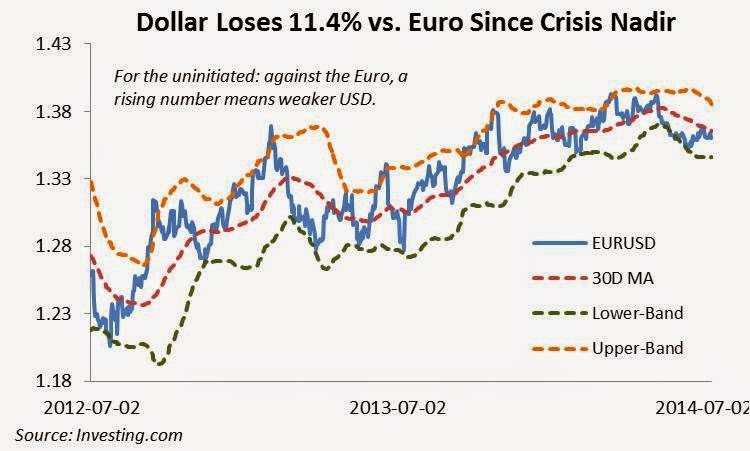 At the same time, the Eurozone is flirting with deflation. 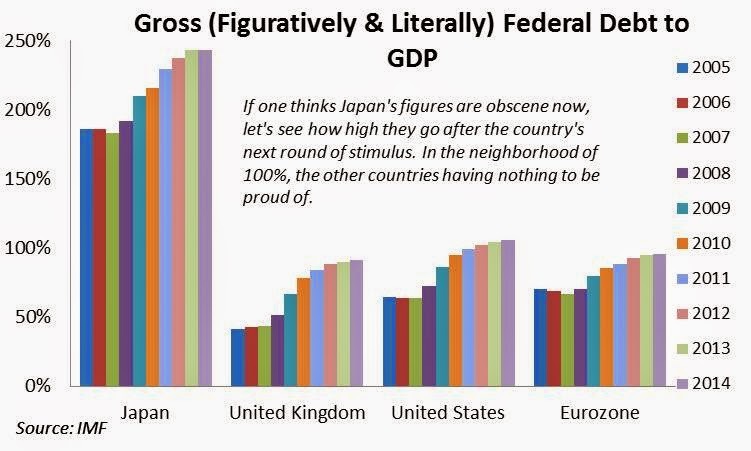 It says a lot when Japan is more effective in stoking upward price pressure than its advanced economy peers. 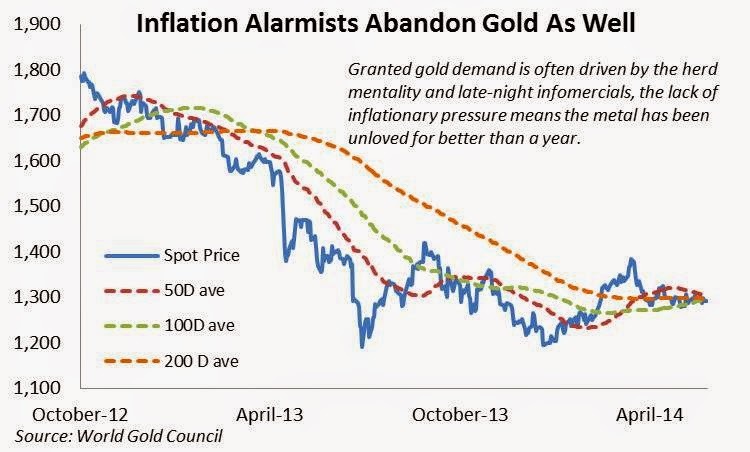 Without any inflationary pressure to hedge, a further rationale for commodities exposure has been reduced. As it stands, commodities exposure is not delivering what it has historically promised. 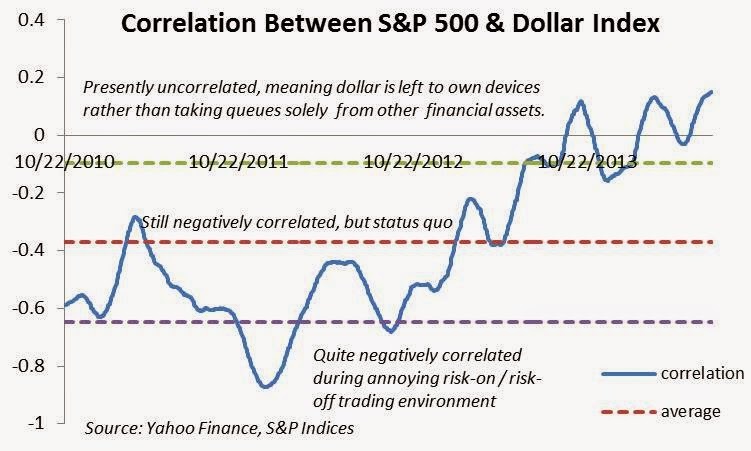 Correlations with other risky assets are elevated, meaning there are few benefits of portfolio diversification. Even if the eventual curtailment of loose monetary policy chases away a large amount of speculative investors…in turn lowering correlations…other merits of owning commodities in the present environment also ring hollow. Inflation remains muted and with global growth stuck in a rut, commercial demand for industrial inputs will fail to match the rates registered earlier in the millennium. In such a scenario, investors may as well chase asset classes like equities, which despite dubious fundamentals, at least generate juicy returns. The genie however is out of the bottle and exposure to raw materials should remain on investors’ radar screens, if not in their portfolios at present. Across the commodities universe, the new sources brought online after the latest round of investment largely have higher marginal costs than the fields, wells and mines of yesteryear. This provides a price floor to many different resources. And if central banks get behind the curve of controlling upward price pressure due to the mountains of money created to combat slow growth, then the need for an inflationary hedge may indeed reappear, especially if economic growth forecasts surprise to the upside…..but let’s not hold our breath for that. For those itching to for commodities exposure today, one avenue is via the shares of commodities producers. Historically these tend to be more correlated with the overall equities market rather than physical market, but they are naturally levered (thanks to firms’ balance sheets) and they’ve been outperforming the broader market of late. Year to date, the energy sector of the S&P 500 has returned 7.5% (including dividends), outpacing the 5% of the broader index. Materials, meanwhile have returned a respectable 6.8% year-to-date. And there still may be more room to the upside as both sectors lagged well behind the S&P 500 over the past three years, with materials and energy returning 10.3% and 9.1% (annualized) compared to the 15.2% registered by the broader S&P. And as evidenced by certain segments of the physical market having tanked of late, investors may finally be differentiating between slices with favorable and unfavorable fundamentals. While not a complete return to normalcy, this development means that those who do their homework can be rewarded. The key is to identify resources with long-term favorable demand dynamics and whose current prices are not too far above the marginal costs of production, which in part may contribute to limiting downside risk. The banking sector never seems to stray too far from the headlines of the financial press. And there is good reason for that. 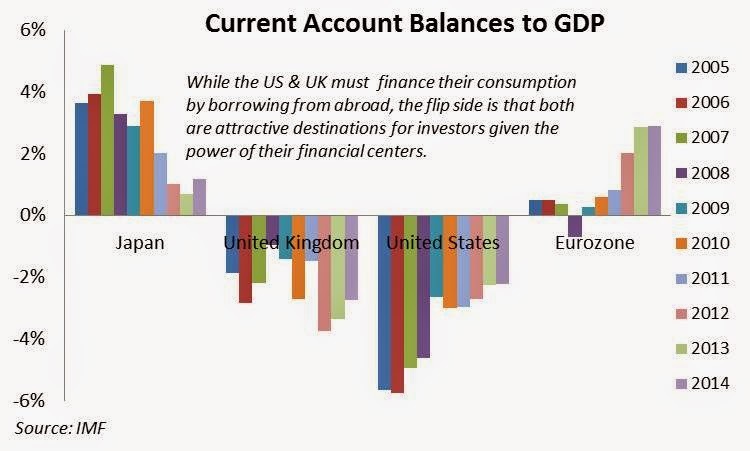 Financial companies occupy a unique nook in advanced economies as they serve as the transmission mechanism to allocate capital…in the form of excess savings…to its most effective use, which are investments offering the most attractive risk/return profile. Therefore an undeniable link exists between a healthy financial sector and overall economic well-being. 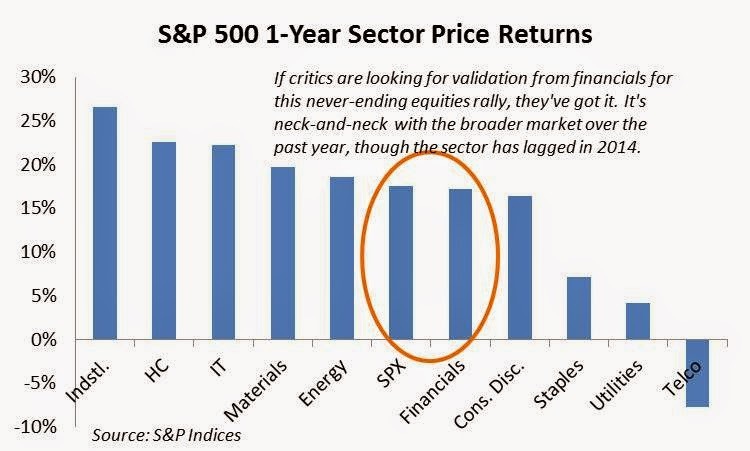 In addition to this broader function, investors shower the sector with attention given that, even after the financial crisis, it remains the second largest bucket of the S&P 500. Investments are not like the entertainment industry, where any publicity is good publicity. Sector stalwarts continue to get raked over the coals for missteps in the run up to the financial crisis. Recent headlines involving one key player’s (Bank of America) error in reporting capital data are reminders of that. Also the current earnings season, as usual, has been front-loaded with banking announcements, which, while varying among components, collectively hints at challenges to top-line growth, especially in key business segments like fixed income and mortgage origination. This week it is particularly relevant to examine the banking sector as the Dow Jones hit a record high and Q1 GDP data came in at a comatose 0.1% annualized gain. Divining the health of banks can shed light on the….ahem….logic underlying the equities rally as well as whether or not we can expect GDP growth, which finally showed signs of life in H2 2013, to rebound after this past winter of discontent. Investors love to say that equities rallies need the validation of financial stocks. In the current instance, they’ve got it….for the most part. 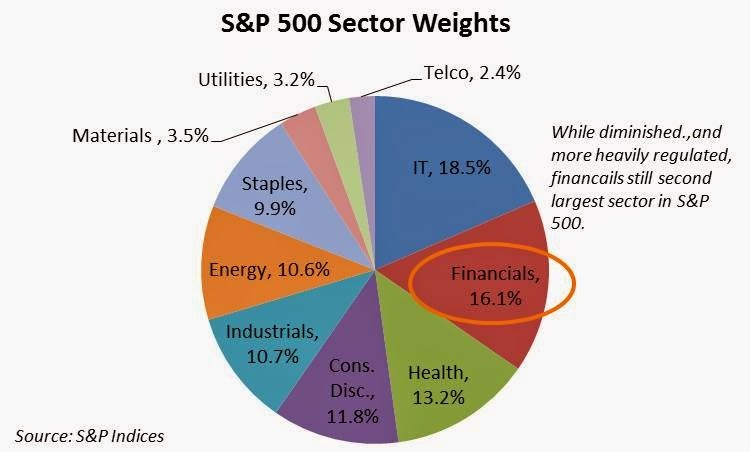 Over the past year, excluding dividends, the financial sector has gained a shade over 17%, only slightly below the 17.6% registered by the S&P 500. For 2013, financials actually outpaced the broader market, but have since come back to Earth, being nearly flat year-to-date, while the S&P 500 is up over 1.5%. Looking further back in time, one can see the same story. Over one-year and three-year periods, on a total return basis, financials have trailed the S&P 20.4% to 19.8% and 13.7% to 12.3% respectively. Over a five-year timeframe, the delta is slightly larger with the S&P’s annualized returns clocking in at 19% and financials, underperforming at 16.9%. Over that length of time, two fewer percentage points makes a hefty difference in total returns. Of course the five-year returns encompass the aftermath of the financial crisis, which includes the bounce-back year of 2010, making all the numbers appear a bit jazzier than they would otherwise. 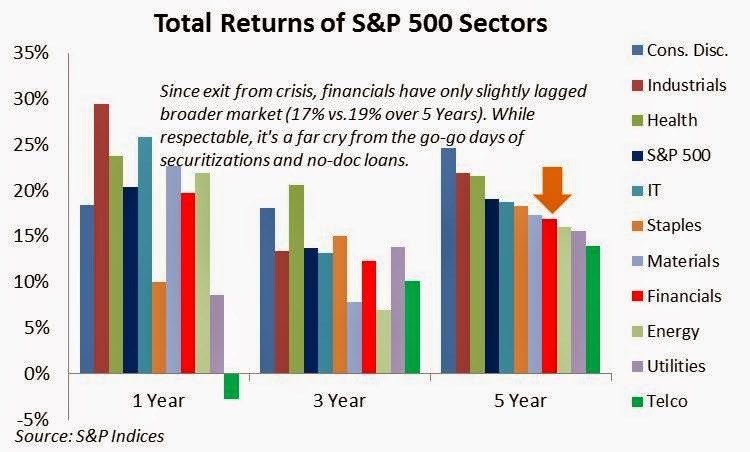 Since then, the fact that financials have not joined more cyclical sectors like industrials, consumer discretionary and IT in the upper echelon of returns can be attributed to the regulatory constraints placed on the industry in the form of higher capital cushions, the evisceration of their trading business and the disappearance of the securitization cash cow. Recent earnings reports from leading banks tell this story. JP Morgan (JPM) saw its net income decrease and Bank of America (BAC) recorded a net loss, in part due to litigation expenses stemming from the housing crisis. The environment remains challenging for large banks as every corporate treasurer and homeowner with a lick of common sense has already refinanced, locking in historic low interest rates far out into the future. So what had been a source of strength in the early stages of the quantitative easing era has become a shortcoming for both fixed-income divisions and mortgage origination. Even Wells Fargo (WFC), which reported an increase in net income of 14%, did so on the back of cost-cutting and not needing as many reserves to cover loans previously considered suspect. Neither of those developments can be relied upon for future growth. Instead, what will be needed in coming quarters is robust top-line growth and that can only come with an improving economic outlook that entices bankers to lend out their considerable funds at a substantially greater pace. Before jumping into that, we must ask the question whether or not banking shares are attractively priced. As seen below, based on estimated full-year 2014 earnings, the nation’s five largest banks all have P/E ratios at 12.1 or under. These are at a discount to the 13.7 of the broader financial sector (below) and dramatically lower than the 15.6 P/E ratio of the S&P 500. Banks are cheap on a Price to Book Value basis as well. But cheap does not necessarily mean attractive. While the sector as a whole has been aggressive in cleaning up the bad-debt mess from the financial crisis…as opposed to European banks…one can see that some firms still have lingering hangovers. Restrictions on dividends by authorities have hampered growth of that previously alluring component of financial shares. 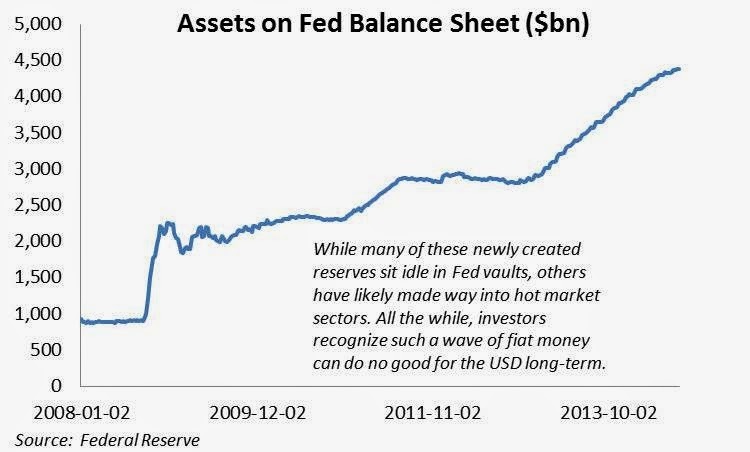 Prior to the financial crisis, when financials were metaphorically printing money, unlike the Fed, which literally printed it during multiple iterations of QE, investors were attracted to banking shares, not just for their securitization-fueled growth model, but also because it was the leading generator of dividends. And as we all know, the more quickly a Board can return capital to shareholders, the lower the chance that it goes off and funds some poorly thought-out acquisition (Countrywide comes to mind). 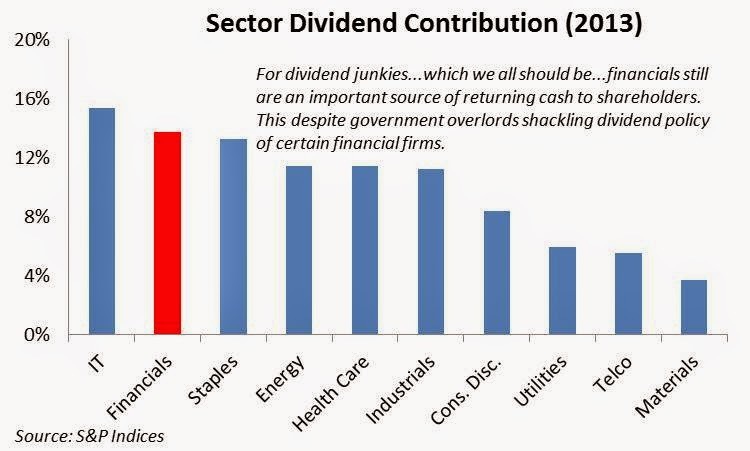 Even today, as seen above, the sector still contributes the second greatest amount of dividends within the S&P 500. And this is with a collective dividend yield of 1.8%, firmly in the lower rung of sectors (telco is 5% and utilities are 3.8%). Imagine what financials could return if regulators took their foot off of bankers’ throats? Spring is here. Are the green shoots? One cannot lay blame for the sector’s woes entirely on its governmental overseers. After all, banks did take some egregious liberties in their lending practices in the mid-2000s, which has merited greater oversight. 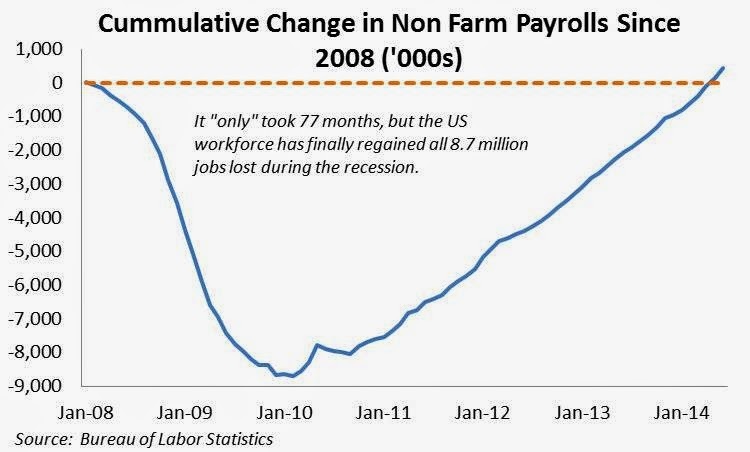 The other constraint hampering the sector is the economy itself. Corporate borrowers don’t like uncertainty and will not increase their fixed costs if future business prospects seem foggy at best. Even if the economy gets a mulligan in Q1 due to a wretched winter, GDP growth has still averaged a depressing 2% over the past 13 quarters. Similarly bankers hesitate to lend in such environments for fear of getting stuck with a bunch of dud loans. Ironically the same authorities that are encouraging banks to be less parsimonious with their reserves are the same ones threatening to sue them back to the Stone Age if their lending is deemed inappropriate or predatory…whatever those mean. With the exception of personal consumption chiming in at 3% in Q1….evidently from brisk hot chocolate sales….the remainder of the data was abysmal. Headline growth was 0.1%, which is one tick from no growth. Nonresidential business investment dipped into negative territory and housing fell off a cliff at -5.7%, following Q4 2013’s wretched -7.9%. Yes some of that can be attributed to the cold, but higher mortgage rates (albeit still low by historical standards), did not help matters. 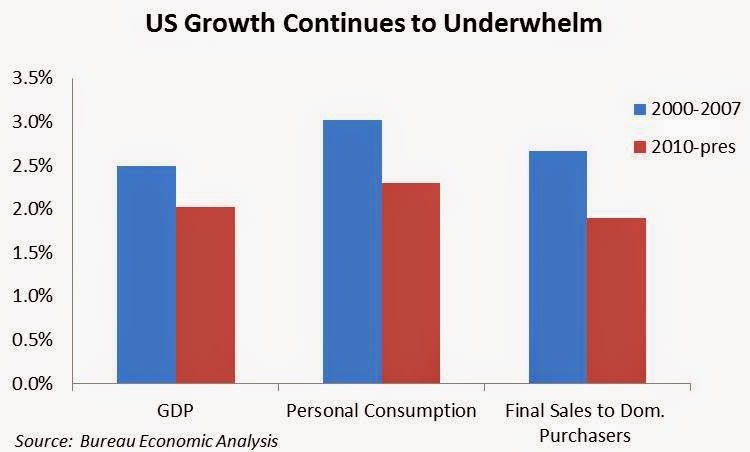 We have previously argued the need for the U.S. economy to rebalance away from a reliance on consumption, which accounts for two-thirds of GDP. 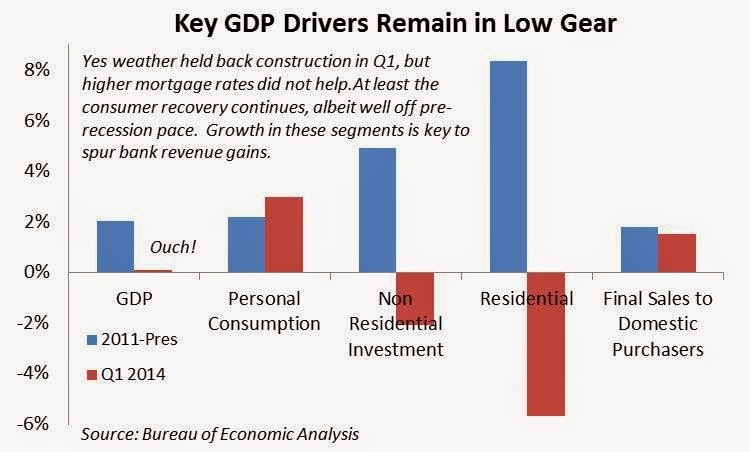 Another favorite mantra is that residential construction should be a consequence of a robust economy, not the source of it, as was the case prior to the crisis. Resolution to those issues are years away however. In the here-and-now, the economy needs robust consumption and a rebound in housing, which sends positive reverberations through a range of other sectors. 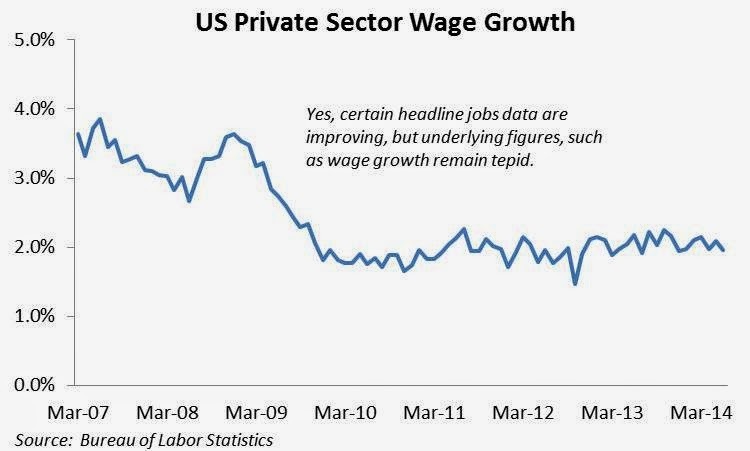 The problem is that, with a weak jobs market, household formation has slowed to a crawl and in several regions subdued wage gains impede the ability of potential buyers to move upmarket from starter homes. There are signs of optimism. 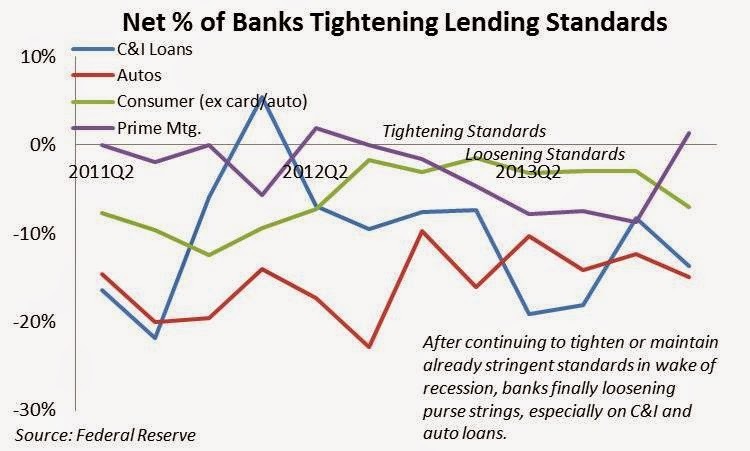 As seen in the confusingly squiggly lines below, lending standards for commercial & industrial (C&I), auto, and general consumer loans have gradually loosened over the past two years. 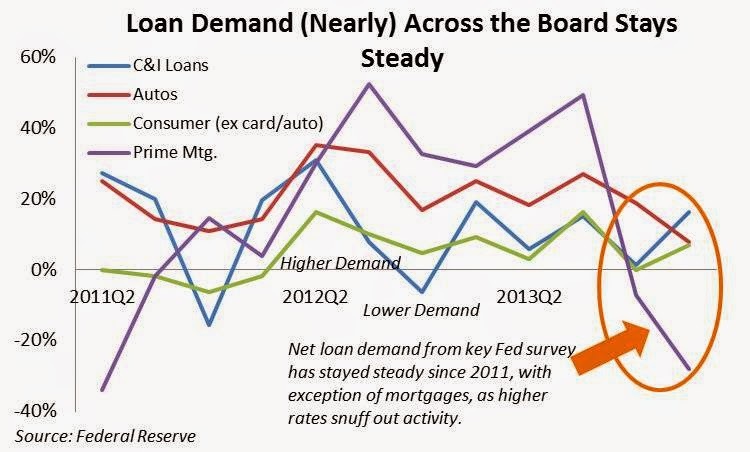 Demand has also picked up for these loans to meet this newfound supply. The sole exception has been mortgage demand, which has taken a nosedive as rates have risen and cash investors have satiated themselves after gorging on the market for years. 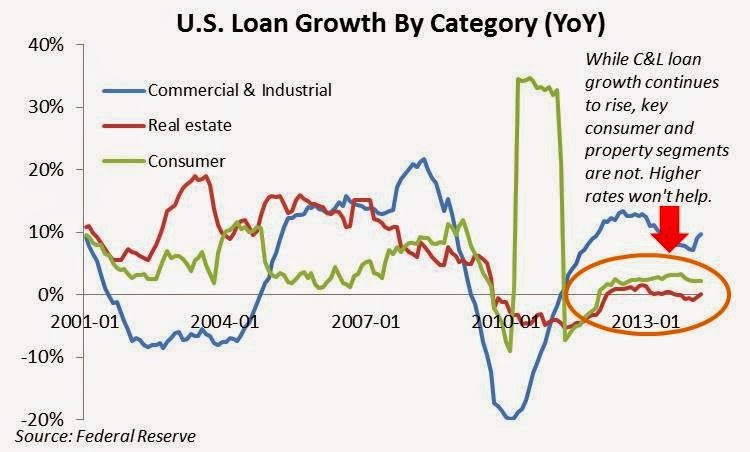 This thawing of the lending market can be seen in the return to growth of outstanding loans. While C&I loan expansion has been impressive over the past few quarters, growth in consumer and real estate loans remains well below pre-crisis levels. As noted above, these two areas have been major contributors to GDP growth over the past few decades and additional credit flowing into them will be necessary in order to increase the trajectory of what has been a frustratingly tepid recovery. On a brighter note, the growth in C&I loans likely represents credit flowing to small businesses…ones too small to tap the hyperactive bond market….which is important given the role smaller firms play in creating jobs in the United States. A rightful place in the portfolio? Better than tulips. So it’s all connected. Optimistic banks, willing to lend, provide a needed catalyst in a highly-levered…euphemism for debt-addicted…advanced economy. A healthy economy further instills the confidence of bankers and also rewards investors by juicing the profits of financial firms. Somewhere in here there is a story about the wealth effect and virtuous circles but it is 1:00 AM and my double espresso has finally worn off, so we best not go down that path. Should one own banking shares today? At current valuations, why not? At the very least they help diversify one’s portfolio, are naturally levered investments and many listings are still sources of attractive dividends. Given the new regulatory hurdles of the gargantuan Dodd-Frank law and the tepid pace of economic growth, especially in debt-dependent sectors, there is probably not much room for upside. This is especially true if one is of the belief that the rationale of this extended bull market is tenuous at best. Not to go totally macro but much depends upon the interest rate environment and how the Fed shimmies out of its extraordinary monetary policy. If one believes that the Fed will back off any threat to raise the Fed Funds rate thus keeping short-term notes tethered to the sub 1% range, and that excess liquidity (or a return respectable growth) will light the inflation flame causing a sell-off in longer-dated treasuries, the ensuing bear-steepening of the yield curve will be manna from heaven for banking net-interest margins. Conversely, if the Fed indeed raises rates while growth prospects remain muted, the consequent bear flattening would squeeze margins while at the same time discourage lending in the slow growth environment. Two divergent scenarios; a question investors and committees must hypothesize over in coming weeks.